These are a couple of dummy covers I designed for possible use on an upcoming novel — not necessarily the next book but eventually. I used my 'trademark' silhouette approach, as in several books we've published before, but decided against them for this novel (and any sequels). Where I have used this sort of thing before, I would do well to stick with it, to maintain a continuity of cover design in a series. My Donzalo and Malvern/Mora books are examples. But it is probably not ideal for this sort of mainstream-with-chick-lit-leanings novel. So I am going with a slightly more conventional look, with photographs of actual women doing yoga. 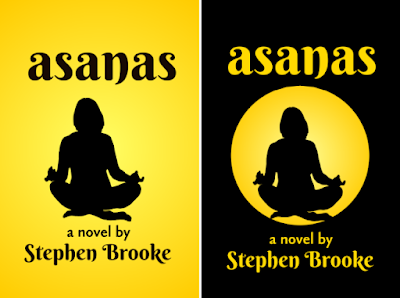 The novel revolves around a yoga class (and, yes, I used to teach yoga classes though it has been something like thirty years) and a pair of friends who attend it. The graphics, the silhouettes will still probably show up small on the back cover. Incidentally, I almost decided to issue this novel under a pen name, what with it being different from any of my other stuff, but decided if it is good enough to publish, it is good enough to have my name on it! When will it show up? No idea; I might keep plugging away at it or find that some other story takes my attention for a while. And there will definitely be another poetry collection out toward the end of the year (or early next).